I'm not one to post a lot of recipes (as in I have never posted a recipe in the 4 years I have been writing this blog), but I have one I wanted to share. On our roadtrip to this summer, we happened upon a cafe in a small town called Warrenton, NC. 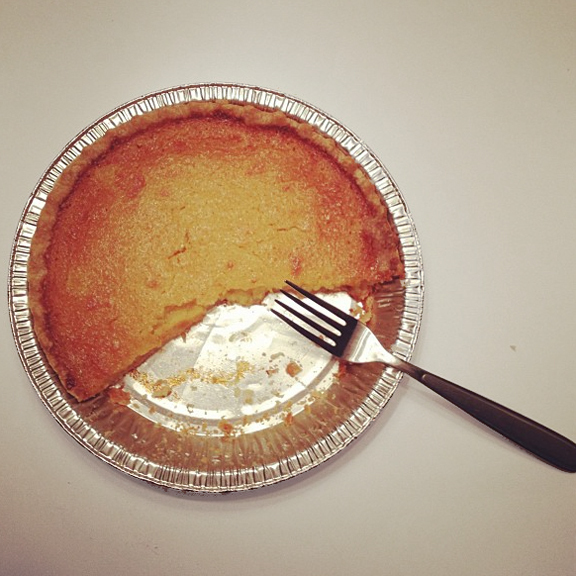 We had buttermilk chess pie for dessert and my husband thought he had died and gone to heaven. Whisk together sugar, cornmeal, flour, and salt. Stir in the butter, buttermilk, lemon juice, vinegar and vanilla. Mix well, then stir in the eggs. Pour mixture into prebaked pie crust. Bake at 375 degrees F for 45 minutes, removing the foil after 30 minutes. Remove from oven when the filling is set (meaning it doesn't wiggle when you move it). You should let it cool, and then eat it out of the pan like I did.